Have you ever wanted a reliable and easy to transport soldering iron without that bulky control box slowing you down? 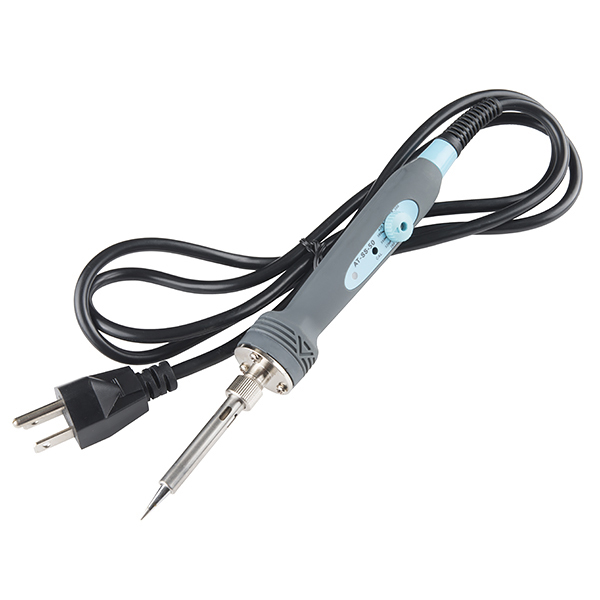 This is a very simple variable temperature 50W 110 VAC Soldering Iron. 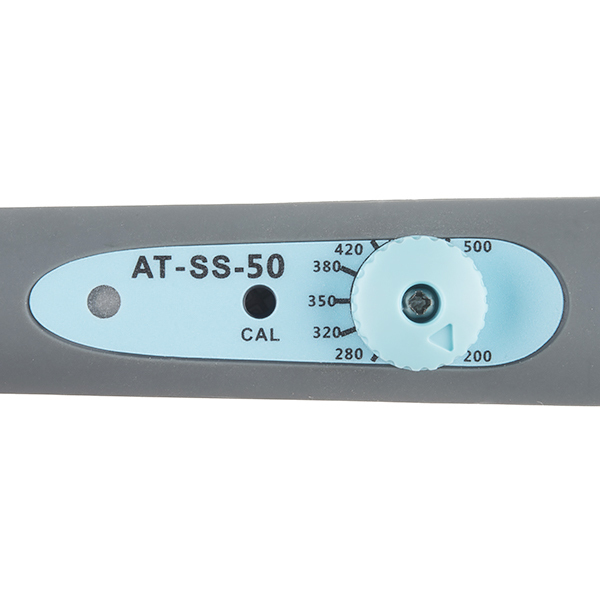 This is a great item for anyone looking for a little bit of mobility out of their soldering iron without loosing the ability to control the temperature. This soldering iron is incredibly easy to use, simply set the temperature on the control knob to your desired heat (350°C is recommended) and get soldering! What's more is that the control knob has a real satisfying click when setting the temperature, this click ensures that you won't accidentally change the heat while you are in the middle of soldering. This unit takes less than a minute to heat up to its max temperature of 500°C. The blue LED next to the temperature control knob will be constantly on while the iron is heating up. Then the LED will start to pulse slowly. 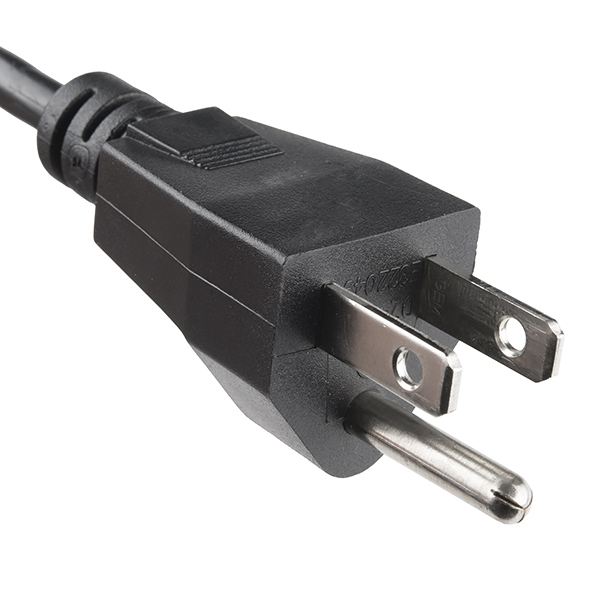 This LED indicates that the iron has reached and is maintaining a constant temperature (also called a control loop or feedback loop). 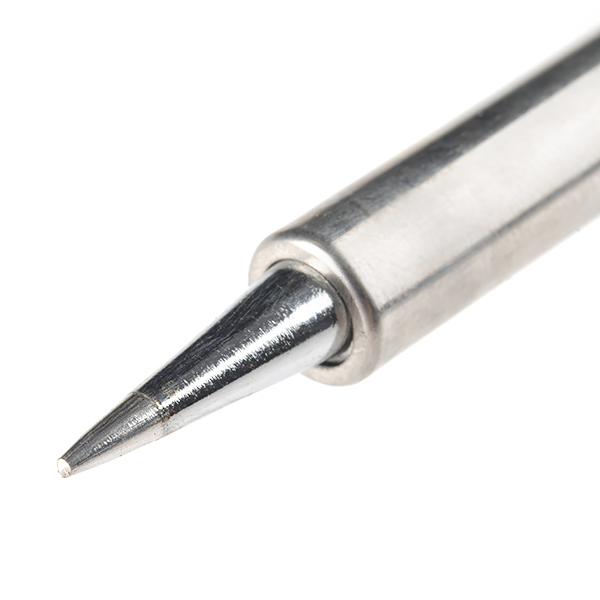 Note: This Soldering Iron is compatible with the Hakko T18 series tips. Does this soldering iron work on 230V 50Hz? It seems that every time I find a product I'd love to buy from SparkFun, it has been discontinued/retired. This one has mostly positive reviews? Why retire it? Sometimes we have to retire things due to manufacturing issues, supplier issues, shipping issues, legal issues....I'm guessing this one fell under one of those categories. Some electronics are so sensitive that they have temperature limits. They'll usually say something like: "do not exceed solder temperature of 270 degrees for more than 3 seconds". The problem being that different solder has different melting points and solder just behaves differently at different temperatures. Some solder burns up at 350 and some will barely melt. Data sheets for components usually have a list of maximums and minimums. 90% of the time I set and forget the iron at around 300-320C. This is a good range for me for standard PTH and SMD soldering. I've had a few occasions when I need to really increase the temp to the 400-450 range; usually when soldering large gauge wires with a lot of thermal inertia. The same reason you'd want a variable temperature* soldering station; A common use case is when you have to work with both leaded and lead-free solder, the latter typically requiring higher temperatures which in turn can make working with leaded solder a potential hassle (especially if it has a flux core that burns up rapidly at higher temps). *However, I think mostly the difference is that a non-variable unit is often also a non-controlled unit. I.e. the 25W goes in, heat goes out, and what temperature that ends up being (due to ambient temperature, the part being solder, etc.) is not actually considered. does this iron take in 220-240VAC? -edit nevermind, didn't see the 110VAC only in the description. Can this be turned off using the temp knob? Or must it be unplugged to be turned off? How much better is this than the yellow firestarter? Approximately infinitely better. If left alone the firestarter just keeps dumping energy into the tip until it burns everything it touches (and itself), whereas temperature control is better for sporadic use while powered. What are the weaknesses of a handheld iron like this vs a low-end station like https://www.sparkfun.com/products/10707 that's bulkier and twice the price? Worse iron holder. Also, potentially lower thermal mass in the iron itself (since the electronics are in there as well). What type of tips does this use? I just tested out a few tips from the Hakko T18 series. They fit like a glove. Heats up really quickly - that's nice. The little knob to adjust the heat is nice too, if you need some variation in temperature. It is light-weight and balanced well. the little blue LED on mine would light while heating, then flicker strangely when hot. This annoys me. I picked this up as my first soldering iron a while back, and it has been fantastic! It heats up very quickly, the temperature is easily adjustable, and all the "veteran" hackers I've worked with say I couldn't have picked up a better stationless iron. It's really made learning to solder seem effortless, and made me wonder what all the "fuss" was about. I highly recommend this iron, it's taken a bit of abuse and is no worse-for-wear.